Along with 2 resources for you, I have a plea for foot advice this month. Both of them make me cry. And both of them stink. (My sincere apologies to onion lovers). Until a few months ago, I had never seen or thought about a bunion. It wasn’t until I had unremitting big toe pain that I jumped onto DuckDuckGo (a wonderful, nontrackable alternative to Google or Bing) and figured out what my problem was. And I’m not happy with the answer! Seems that bunions are created by too much pressure on the toes, which stresses the metatarsophalangeal joint and forces the toes in an unnatural direction. Most bunion info blames high heels. I have never, not even once, put on high heels (not being a girly girl). However, I wear close fitting hiking boots every week. And during the summer months, I wear them for weeks at a time without a break. So apparently my hiking boots are too snug. Or maybe my socks are too snug inside my boots. Or my feet are expanding. Possibly, it's a cruel cosmic joke. Regardless, things have got to change. 1. Buy toe spacers for $1.99 and wear them while I’m sitting at my computer. 2. Do some daily foot and toe stretches. 3. Use anti-inflammatories during and after each hike, as a short term remedy. This also knocks the pain down to a manageable level so I’m not hobbling back to the trail head. 4. Give my feet a massage with high quality oil, put on cozy socks, and then put them up on a soft surface while I read books about hiking! If you have any other non-surgical recommendations, I’m all ears (toes?)!! And I’d be happy to hear about foot issues other hikers have conquered, so please send along your inspirational stories. No, it isn’t the Yellow Brick Road (although it’s near the Emerald City). It’s better than that! It’s the Wonderland Trail. Or, as I like to call it, The WanderLand Trail. And it’s in my backyard: a necklace of wonder, strung around Mt. Rainier, in Washington State, only a short drive from Seattle (the aforementioned Emerald City). 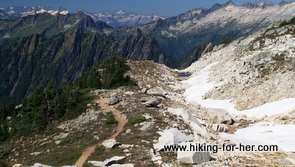 Someone wrote to me recently for a recommendation of good trails for women to do solo, and although I had written about the PCT and the AT, along with the Superior Trail, I realized that the Wonderland Trail had been omitted from my website. So I've re-mediated my omission,complete with pictures, on this truly wonderful trail encircling Mt. Rainier. New Resource - Is It Useful To You? Something landed in my in box last month that I just have to pass along. Dan Corcoran has been involved with wilderness courses in my neck of the woods: Pacific Northwest. He recently developed a “members only” site which teaches outdoor survival basics, one short video at a time. He’s funny and sincere, and very knowledgeable. I trust his outdoor skills because I've been following his work for a while. I’m enrolled in his course right now, working on Module 5 which covers food issues in a survival situation: preparing yourself mentally to go without food, important foods to identify and focus on, the easiest foods to gather, and lots more. Unfortunately, he’s not letting anyone else enroll at this time. However, by using the link below, you can put yourself on his waiting list to be notified when he opens up enrollment again. I see this as a good thing: he wants to control the quality of what he’s offering, by limiting the number of people and then acting on their feedback. The sample videos allow you to have a taste of what the entire course is like. In my humble opinion, it’s always better to be forearmed with knowledge when you put yourself out there, especially solo female hikers or those with responsibility for less strong hikers (kids, for instance). UPDATE 2016: He no longer offers this course, so the link has been removed. The dark days of winter are approaching us in the Northern Hemisphere (while southern hikers are rejoicing, and for good reason). What will you do to build your hiking skills during the "off" season? Maybe the link above will whet your appetite. As for me, it's time to clean up my gear and begin planning next year's hiking adventures. Hopefully, hiking with bunions will not slow me down! Best wishes for your November. Please feel free to contact me with questions, comments or advice. I enjoy reading all the messages from women hikers that find their way into my virtual mailbox.